Painting on glass is an application of paint in a very versatile medium. Once painted, the glass objects can be used for common use or as a decorative object. But depending of the quality and method of fixing the paint on the glass, it is recommended to use it only as decorative objects. Thanks to new paint for glass crafts developed, nowadays it easy to find the necessary materials to paint on glass. Although it looks like a complex technique, it is painting with other paints and another material, in this case the glass. It is neither more nor less complicated but it requires practice and to know how the paint reacts on this support. Only by practice we can learn and it is a technique that gives a lot of satisfaction when you achieve what you want. Basically there are two types of paint, water or solvent. These paints can be applied with brushes or sponges. The most commonly used are the water-based paints. Solvent paints have denser colors, are more transparent and they adhere well to the glass, but takes longer to dry. You can also use a lead adhesive to create windows effects on the glass allowing a lot of creativity and it creates true works of art colorful and bright. There are also gels and transferable paints. The gel glass is used to create volumes and allows you to create many effects that can be mixed with colors and with sand or other similar materials that add more volume and variety of textures. First, this gel must be dried for a week before getting the object in the oven. With new glass paints can set the colors using the home oven, allow for cooking at 150 ° C for 30 minutes, providing a good fit. 1. We clean the glass before painting. Rubbing alcohol or glass cleaner will help remove residual grease left in the piece. 2. We must read the product instructions for glass painting, as each one indicates a difference in the application. 3. All glass can be baked. Simply place it in a cold oven, I let the oven is heated to the desired temperature, set the timer and bake for the time required. After cooking let the piece to be cool before removing from oven. See the instructions for this picture. 4. The resin-based paints such as Pebeo Vitrea 160 can be corrected before being baked. Simply errors with cotton soaked in warm water or alcohol are cleaned. You can also let it dry and scrape with a knife. 5. All brushes can be used on glass paintings. Tools can be cleaned with soap and water. 6. When templates are used, which are adhesive work best. 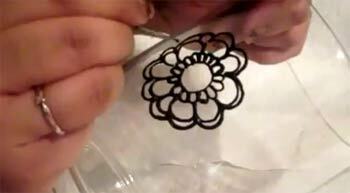 Paste the template applied to glass and paint with a sponge. 7. You can get many of the effects using mediums (diluents), fittings and ancillary products. Some paintings do allow effects of frost or crackle effects. There are also options of matt and bright colors, others to create volume and highlighting effects, etc..
10. Do not mix various paints because they have a different chemistry and the combination of two different paint products could lead to undesirable results! On youtube you can find many videos of people painting on glass some very good ideas. I leave a couple of videos here to see inserted but you just have to go to Youtube and write for example: glass painting (painting on glass). Floral design in a glass jar. Another video of a floral pattern on glass. And finally, a few more ideas for painting on glass.